Baking from scratch is ideal, but sometimes life gets in the way. I love cake. Seriously. Cupcakes, pound cakes, layer cakes… You name it, I love them. The problem is that between soccer practice, batch cooking and keeping the dust bunnies at bay, to say nothing of work, I don’t always have time to whip up a beautiful chocolate cake ‘just because’. Heck, even cupcakes for the school event that the kiddo mentioned this morning, and which are due at the classroom tomorrow, can throw a wrench in my day. So I’ve made peace with cake mix. It’s my friend now and after you finish reading these hacks, my guess is that it will be yours too! Vegetable oil doesn’t add much to the taste of cake mix but it’s the necessary ‘fat’ that the recipe will always call for. Replacing the oil with melted butter would make even Julia Child a little bit proud and will take your cake up to bakery level flavour. Instead of water, use milk. It adds to the flavour and improves the texture too. 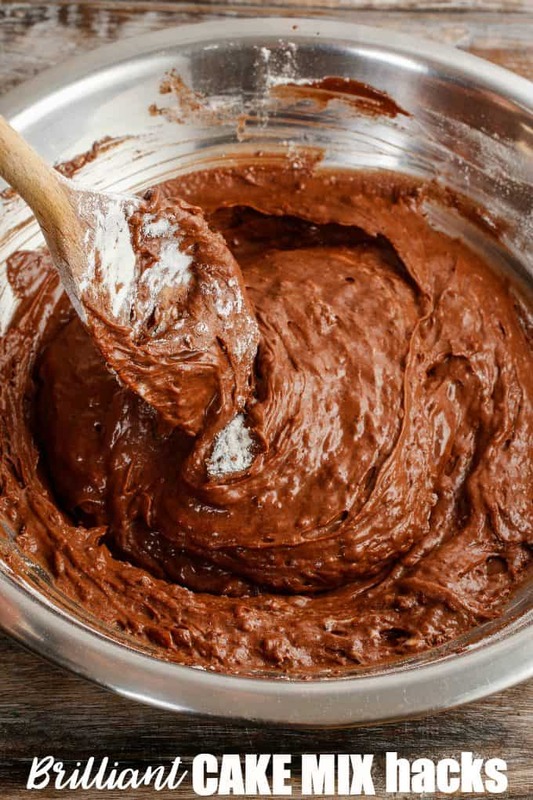 Chocolate milk ramps up a standard chocolate cake mixture or you could also use buttermilk but if you do, add a little more than a one-to-one ratio. Want to get to the next level of yum? Replace the water, again on a one-to-one basis, with… wait for it… melted ice cream. Chocolate cake could become chocolate rocky road cake. Just think of the possibilities! You can also turn plain old chocolate cake into mouthwatering mocha heaven by replacing the water with coffee. And if you use boiling water or coffee instead of cold or room temperature, your chocolate cake mix will taste extra chocolate-y and rich. If you find the standard yellow cake too sweet, add lemon juice and zest. Presto: instant tartness to cut through the sweet. Adding an egg to the recipe will give your cake a fluffier texture and more height. So if you’re going to for a layer cake, this could be just the ticket. Another option is to add two tablespoons of mayonnaise. It will add a creamy texture to an otherwise standard box mix. You can add things to a cake mix without much risk to the end product: shredded coconut, chopped nuts, sprinkles, raisins… whatever you want! You are only limited by what’s in your pantry! Dip into the vanilla or rum extract for extra fun and flavour, or how about some pumpkin spice in the yellow cake? The beauty of mixes is that they simply set the stage: it’s up to you to put on the full production and create your own flavour combinations. Add a layer of jam or jelly to a cake made from box of devil’s food cake mix sing. A little whipped cream, some shaved chocolate… your family and friends will think you slaved for hours! Mix it all together and add in chocolate chips, nuts or whatever you want. Dollop onto your cookie sheet, as you would any other cookie batter and bake for 10 – 12 minutes in a 350F degree oven. Easy peasy! This recipe from the Food Network Canada can only be made here in Canada. Why? Because you need a Timbit and boxed vanilla cake mix to pull it off. Trust me, eh? Do you have any cake mix hacks you want to share with us? Shhh… I won’t tell anyone! I’ve always added an extra egg for extra fluffiness. I’ve never thought about adding milk or buttermilk, though, that seems brilliant. Thanks, will have to try some of these hacks out. Thanks for sharing,most of hacks i honestly didn’t know ! Have never tried making cookies from a cake mix but that’s a great idea. These are all awesome ideas. Thanks for sharing! I’m no cook that’s for sure. So I’ve always used boxed cakes but you are right, they are pretty insipid. What a great idea to switch the oil for butter and the water for Melted Ice cream. Whoa. That sounds amazing! I never have thought to use butter instead of oil but that would definitely give great flavour. Great ideas…I’ve added these tips to my recipe file, Thanks you! I would never have thought about adding mayo! What a treat. Great tips. Adding mayo really does give the cake a richer taste and I have been adding mayo to my cakes for years. Replace the water with melted ice cream sounds so interesting. I will have to try this. Oh Cool! I always replaced the water with milk but I never thought of buttermilk!! Yummy!! Thanks for sharing how to make cookies.Would save my bacon when it is 10 o’clock and I am snack mom. Love the cake mix hacks. Cake mix is easy to keep on hand, often on sale, and versatile. Saving this post! For creamy buttery cookies add 1 egg, 1/2 cup butter and 8 oz cream cheese to cake mix. Combine till smooth dough. Place in fridge for 30 minutes so dough is easier to handle. Roll 1 inch balls, roll in icing sugar and cook for 12 minutes at 350. Great cookies no work. Can’t wait to try these hacks! Thanks for sharing, Stacie!